These abortion advocates used vivid imagery—coffins and coat hangers—to draw attention away from the pre-born and force politicians and the public to focus on the women in front of them. … This New Abortion Caravan will also use vivid imagery. However, instead of focusing on a woman’s “choice,” this team from the Canadian Centre for Bio-Ethical Reform (CCBR) will use abortion imagery to force the Canadian public to consider what is being chosen. For the CCBR, the use of coffins and coat hangers in the original Caravan to symbolize the deaths of women from illegal abortion, must be countered with photographs of aborted fetuses (whether real or doctored) in relation to other examples of genocide, such as the slaughter of Indigenous peoples at Wounded Knee, Jews in the Holocaust, and African Americans lynched in the United States. Margot Dunn, one of the original Caravaners, refuted such comparisons by pointing out that the most appropriate equivalent for the images the CCBR uses would be those featuring women who had died from botched abortions. Nevertheless, by drawing a shaky comparison between both Caravans, the CCBR attempts to justify the use of vivid and graphic imagery of aborted fetuses in order to portray the preborn as victims of genocide (see Dr. Carol Williams’ work on the CCBR’s use of imagery and “Genocide Awareness”). In her 2002 article, Leslie Cannold argues that responses to the anti-abortion movement “must include not only literal rebuttals based on evidence, but also information and arguments that are able to counter its ideological power.” At face value, the CCBR’s ultimate goal in mimicking the original Caravan is to legitimize the CCBR Caravan by asserting that it has a historical precedent upon which to base its anti-abortion protest. However, the deeper meaning of this mimicry is to change forever the meaning of the original Caravan. Significantly, the promotional video intones that while the original Caravan, “once signaled the coming of a great injustice,” the CCBR Caravan “will make the invisible victims visible” by reversing “the bloody legacy” of the original Caravan. These statements signal that the CCBR wishes to erase the original Caravan’s legacy that was based on abortion rights and replace it with the new Caravan’s message of abortion as a genocidal atrocity, thereby focusing on fetal rights. 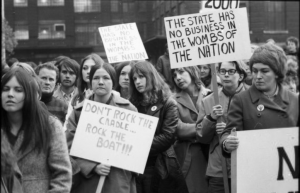 To build opposition to the CCBR’s “Genocide Awareness” message campaigns, and to preserve and celebrate the history of the original Abortion Caravan and its significant contribution to women’s reproductive rights in Canada, the CCBR’s imitation of the 1970 Abortion Caravan needs to be critiqued. The original Caravan is often nodded to in abortion historiography as a significant step in the full decriminalization of abortion services in Canada in 1988. The CCBR’s efforts to co-opt the meaning and remembrance of the original Caravan is an attempt not only to overturn women’s reproductive rights, but to erase a crucial aspect in feminist history. Karissa Patton is completing her M.A. in the Department of History and Women and Gender Studies at the University of Lethbridge, Alberta, Canada. See, for example, Judy Rebick, “Part II: The 1970s,” in Ten Thousand Roses: The Making of a Feminist Revolution (Toronto: Penguin Canada, 2005); Christabelle Sethna, and Steve Hewitt, “Clandestine Operations: The Vancouver Women’s Caucus, the Abortion Caravan, and the RCMP.” Canadian Historical Review 90, no. 3 (September 2009): 463-496; Shannon Lea Stettner, “Women and Abortion in English Canada: Public Debates and Political Participation, 1959-70,” (PhD dissertation, York University, 2011). Leslie Cannold, “Understanding and Responding to Anti-Choice Women Centred Strategies,” Reproductive Health Matters vol. 10 no. 19 (2002), 177.